JUNO Nominated Celso Machado is a wonderful example of the musical riches currently flowing into Canada from many parts of the world. He has lived on our west coast since 1990 and since then has become a most appealing voice in the national conversation. He does his utmost to bring the warmth and richness of his native land to our rapidly thawing cultural tundra. A virtuoso Brazilian guitarist, percussionist, and composer, Machado, brings joy to his audiences with his subtle mixture of musical inspiration and irresistible rhythms. 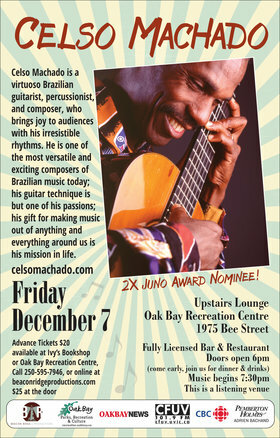 For forty years Celso Machado has been performing on concert stages throughout Brazil, Western Europe, Scandinavia, Canada, and the United States. Considered one of the most versatile and exciting musician/composers of Brazilian music today; his guitar technique is but one of his passions; his gift for making music out of anything and everything around us is his mission in life. Brazilian music has arisen out of various blends of Classical European, African, Portuguese, and Indigenous influences. There is less division in Brazilian music between classical and jazz, jazz and folk. While Celso’s music is rooted in Brazilian rhythmic and melodic styles, it also reflects his incurable fascination with other world music traditions. He finds similarities between the music of southern Italy and northeast Brazil, the Egyptian Maqsoum and the Brazilian Baião rhythm, the Moroccan Gnawa rhythm and Afoxé and Samba. Celso incorporates these influences into his own sound; his own unique contribution to the ongoing evolution of Brazilian music. Drawing on his thorough study of classical guitar, Celso composes for guitar and ensemble. His remarkably innovative compositions are infused with a rich knowledge of the traditional music of Brazil: samba, chôro, baião, frêvo etc. Published by Editions Henry Lemoine in Paris, his compositions are performed and recorded worldwide. The Upstairs Lounge is a licensed restaurant and bar, doors open at 6 pm for dinner service, the concert starts at 7;30 pm. Please note this is a listening venue.